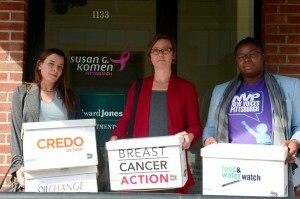 I delivered your petition signatures to Susan G. Komen along with Dana Dolney of Friends of the Harmed (left) and La’Tasha D. Mayes of New Voices Pittsburgh. What a month! A few weeks ago, we learned that the world’s largest breast cancer charity Susan G. Komen is in partnership with Baker Hughes, a leading global fracking corporation. 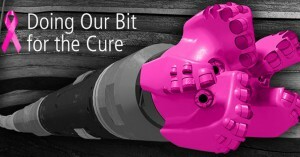 Baker Hughes is distributing 1,000 pink drill bits “for the cure” and donating $100,000 to Komen. This partnership is one of the most egregious examples of pinkwashing I’ve ever seen. Hundreds of thousands of people across the country shared my shock and outrage and joined us to take action in the largest grassroots opposition to pinkwashing ever. I was proud to deliver over 168,700 petition signatures to Komen’s affiliate in Pittsburgh, PA last Friday – all of which we gathered in just over two weeks! Thank you to everyone who signed the petition and to our partners at EcoWatch, Oil Change International, Food & Water Watch and CREDO Action. Challenging this pinkwashing partnership was a true grassroots groundswell. 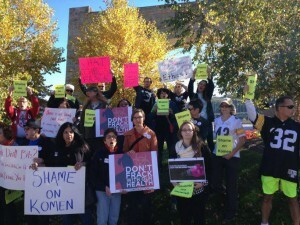 Activists rally against the pinkwashing partnership between Susan G. Komen and Baker Hughes. And on Sunday, we organized a rally with anti-fracking activists and women’s health activists from Pittsburgh and beyond, including the strong women of Friends of the Harmed and New Voices Pittsburgh, to rally outside the Pittsburgh Steelers football game where Komen was scheduled to accept Baker Hughes’ check. We carried signs, passed out flyers, and talked with thousands of fans about this shameful pinkwashing partnership. We were met with support – and disbelief – by most of the people we talked with. 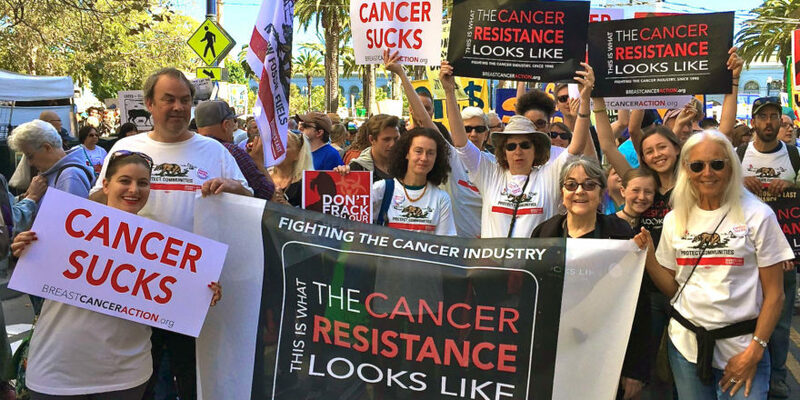 Fracking is a toxic process – at least 25% of the more than 700 chemicals used in fracking are linked to cancer. With this pinkwashing tryst, Komen is complicit in a practice that endangers women’s health. Komen and Baker Hughes have created a perfect profit cycle whereby Komen raises millions each year to try to cure a disease its funders are helping to cause. This is unacceptable. Baker Hughes’ pinkwashing drill bits. Komen heard our objections loud and clear and, and in response to public pressure, scrapped a public check presentation in favor of a private exchange in a luxury suite high above the field. And instead of showing up to accept the check herself as was initially planned, Nancy Brinker sent Norm Bowling, Chief Revenue and Marketing Officer (his title says it all). Thanks to our work together to educate, organize and take action, we exposed the feel-good ceremony swathed in pink as the dirty PR stunt that it really was. But simply conducting their business out of the public eye isn’t good enough. Komen needs to break ties with the fracking industry and take a stand against this toxic process. We will continue to actively oppose the toxic process of fracking because it endangers our health. Thank you to everyone who took a stand against pinkwashing by signing the petition and joining us at the rally in Pittsburgh to demand that Komen break ties with the fracking industry. Our health is not for sale, and we will continue to keep the pressure on pinkwashers to clean up their act and put women’s health before corporate profits. This entry was posted in BCA Action Alerts, BCA Events, BCA News.